Got Bugs ... We can help! To schedule an appointment, or speak with one of our pest control representatives, please call (972) 935-9883 or Click Here. 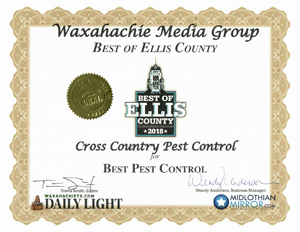 Your Ellis County Pest Control Company! !!!! !Now Open - Austin/Travis County Area Office!!!! At Cross Country Pest Control, our team of pest control experts bring over a decade of experience to your pest control problems in Ellis, Johnson, Navarro, Dallas, Hill, and Tarrant Counties. Our goal is to eliminate your pest and insect problems, while providing outstanding customer service. From day one, we were determined to bring professional, competent, and focused attention to our client's pest control problems, and we start with a single idea...you are not just a number in some database...you are a valued customer within our community. Cross Country Pest Control is locally owned and operated with all of our technicians being professionally trained to provide the utmost satisfaction and customer service to our clients. We proudly serve businesses, homes, and government buildings, including the Ellis County Courthouse, the Ellis County Sheriff's Department as well as other Ellis County facilities. As members of the community, we take pride in serving our fellow citizens, and the Hunt Family is proud to provide a valuable service to the Ellis County and South Dallas area. If you have a pest control problem, we would enjoy the opportunity to discuss helping you gain control of your home or office again. Simply contact our office to schedule an appointment with one of our trained professional pest control technicians. Cross Country Pest Control home pest control treatments include both the exterior and interior of the home. However, we can focus on just one particular area if you desire. Cross Country Pest Control's service for commercial properties includes such businesses as industrial plants, strip malls, stores and shops, storage warehouses, schools, day cares, restaurants, offices, county and city facilities, including correctional institutions. AREAS SERVED:Cross Country Pest Control provides pest and termite control throughout Ellis County, including the following cities located in Ellis County, Texas: Alma, Avalon, Bardwell, Ennis, Ferris, Forreston, Garrett, Glenn Heights, Italy, Maypearl, Midlothian, Milford, Oak Leaf, Ovilla, Palmer, Pecan Hill, Red Oak, and Waxahachie. We also provide residential and commercial pest control service to Johnson, Hill, Kaufman, Navarro, Rockwall, Tarrant, and Dallas Counties, including the cities of Cedar Hill, DeSoto, and Lancaster.